Our team will be glad to answer any questions you may have, and we will provide all of the information that you need to determine which treatment is right for you. Please contact our practice to schedule your initial exam. You're one step closer to achieving the smile you've always wanted! After your complimentary exam, if you decide to proceed with treatment, records are then made to determine the best course of treatment. Complete diagnostic records typically include study models of the teeth, photos of the patient's face and teeth, X-rays, and spacers (if needed). This information is used to develop a custom treatment plan that addresses the unique needs of each patient. 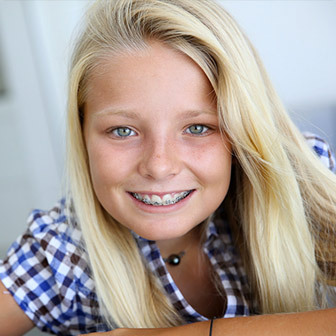 These records are also helpful in tracking the progress of treatment as the teeth move under orthodontic care. After the Records Appointment, we'll be ready to schedule the appointment to get your new appliances (braces, expanders, etc.) placed. Getting appliances placed usually takes one to two hours. You'll then see us at regular intervals four to eight weeks apart for an adjustment, which takes about 20 minutes. Patients are seen by appointment only. We make every effort to be on time for our patients and ask that you extend the same courtesy to us. We understand that “life happens”! If you're running late or need to reschedule, please let us know and we will do everything we can to accommodate you. If you cannot keep an appointment, please notify us immediately. When you're ready to schedule your appointment, contact our practice and our friendly scheduling coordinator will assist you. We're looking forward to working with you.